Puzzles are such great toys for kids, but a good sturdy wood puzzle can be pricey and with the risk of losing a piece usually pretty high, and a puzzle being just about useless without all of the pieces, who wants to spend a lot of money on one? Ashley created some great handmade puzzles using MDF and some fun free printables from her site, but the tutorial would work with any image, so you could use a family picture or other free printables that you find online! The part I love best is that the pieces are large and hard to lose, but if a piece does disappears you can always make a replacement! 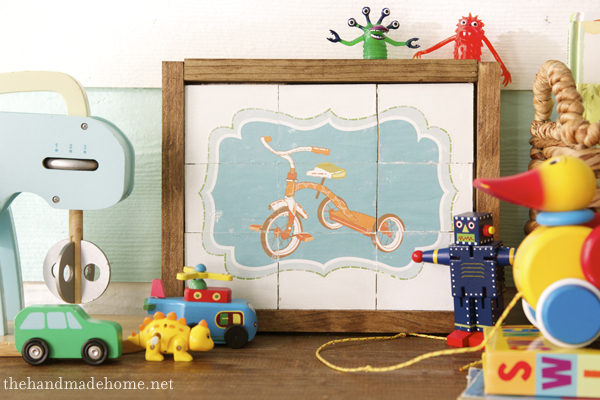 You can check out how to make a puzzle over at The Handmade Home.